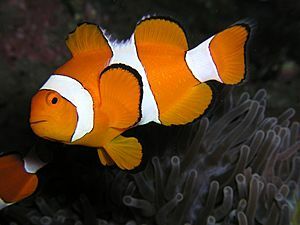 Clownfish or anemonefish are fishes are a variety of saltwater fish. Thirty species are recognized. Depending on species, anemonefish are overall yellow, orange, or a reddish or blackish color, and many show white bars or patches. The largest can reach a length of 18 centimetres (7.1 in), while the smallest barely achieve 10 centimetres (3.9 in). Anemonefish are native to warmer waters of the Indian and Pacific oceans, including the Great Barrier Reef and the Red Sea. While most species have restricted distributions, others are widespread. Anemonefish live at the bottom of shallow seas in sheltered reefs or in shallow lagoons. There are no anemonefish in the Atlantic. 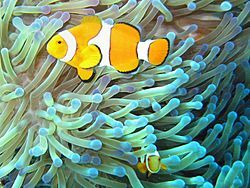 Anemonefish and sea anemones have a symbiotic, mutualistic relationship, each providing a number of benefits to the other. The sea anemone protects the anemonefish from predators, as well as providing food through the scraps left from the anemone's meals and occasional dead anemone tentacles. In return, the anemonefish defends the anemone from its predators, and parasites. One theory about how they can survive the sea anemone poison is the mucus coating of the fish may be based on sugars rather than proteins. This would mean that anemones fail to recognize the fish as a potential food source and do not fire their nematocysts, or sting organelles. Anemonefish lay eggs on any flat surface close to their host anemones. In the wild, anemonefish spawn around the time of the full moon. Depending on the species, anemonefish can lay hundreds or thousands of eggs. The male parent guards the eggs until they hatch about six to ten days later, typically two hours after dusk. Anemonefish make up 43% of the global marine ornamental trade, and 25% of the global trade comes from fish bred in captivity, while the majority are captured from the wild. When a sea anemone is not available in an aquarium, the anemonefish may settle in some varieties of soft corals. Once an anemone or coral has been adopted, the anemonefish will defend it. 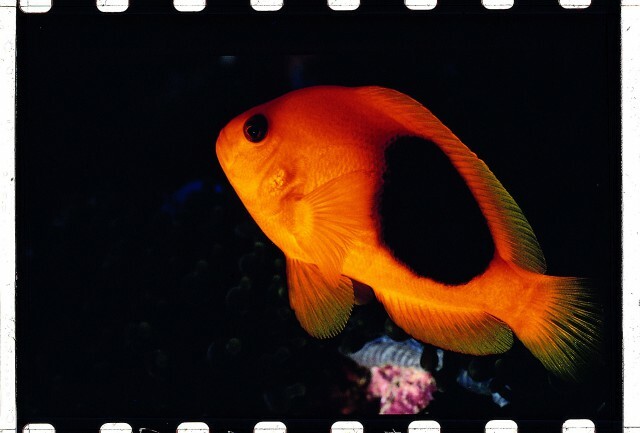 Anemonefish, however, are not obligatorily tied to hosts, and can survive alone in captivity. In Pixar's 2003 film Finding Nemo and its 2016 sequel Finding Dory, main characters Marlin and Nemo are clownfish. The species depicted in the film is A. ocellaris. A pair of pink anemonefish (Amphiprion perideraion) in their anemone home. A. percula (Clown anemonefish) in a 'normal' orange and a melanistic blackish variant. Clownfish Facts for Kids. Kiddle Encyclopedia.